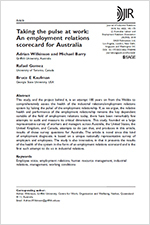 The subject of this research is the health of the employer-employee relationship. 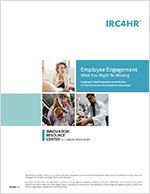 The goals of the study were to assess what determines the effectiveness of the relationship and the impact of the relationship on organization performance and employee wellbeing. 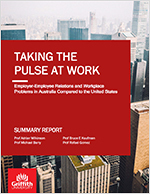 The study is based on a multi-national survey of employers and employees (in the US, UK, Australia, and Canada), and examines a broad range of HR and other workplace practices. Bruce is Professor Emeritus of Economics at Georgia State University. His main area of research covers cross-disciplinary dimensions of the employment relationship, including labor economics, human resources management, industrial relations, labor and employment law, and business and labor history, with an emphasis on the institutional economics perspective. Professor Kaufman has written or edited eighteen books and more than one hundred journal articles and chapters. Michael is Professor of Employment Relations in the Griffith University School of Business in Brisbane, Australia. Besides being a long-time chair of the department, he has published research on a variety of human resource and employment subjects, such as employee voice, employer associates, and international and comparative employment relations. His latest edited book is The Research Handbook of Employment Relations in Sports. Adrian is Professor and Director of the Centre for Work, Organization, and Wellbeing in the Griffith University School of Business in Brisbane, Australia. Professor Wilkinson has authored, coauthored, or edited thirty books and more than 150 articles. He has been included in HR Magazine’s list of most influential thinkers in international HR. His latest co-edited book is the Oxford Handbook of Management. Rafael is Professor of Employment Relations at the University of Toronto and since 2015 has been the Director of the Centre for Industrial Relations and Human Resources. Sign up to receive updates about this project and more from IRC4HR.